Click here to see a hilarious bit by Stephen Colbert, who spoofs the Norwegian Slow TV broadcast of “National Firewood Night.” Despite multiple lampoons of the program, U.S. production companies like LMNO (of TLC’s “The Little Couple” fame) and PBS have cashed in on the concept. Yep, it sounds about as exciting as watching paint dry. And I’ll admit, if you pair the program with a six-pack of brewskis, it could potentially elevate the term “couch-potato” to a new level of drooling stupefaction. But don’t mock it until you’ve tried it. Sakte-tv (Slow TV ) is a Scandinavian construct that, in this fast-paced, high-pressured world, has proven to be a surprisingly popular global export. Britain and Canada have created their own versions, and even the U.S. has bought rights to the format. 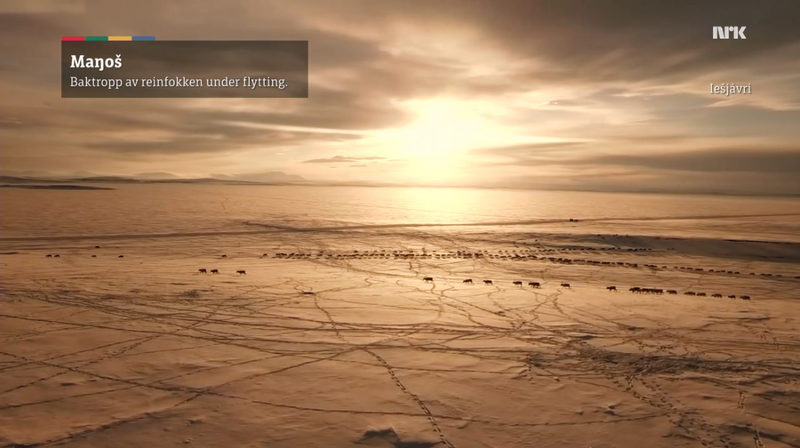 NRK (National Norwegian Broadcasting) produced “Bergensbanen: Minutt for Minutt” to celebrate the 100th anniversary of the route, rated by National Geographic as one of the world’s best train trips. Click to view footage from the actual show. Norwegians endured quite a bit of hazing when sakte-tv debuted back in 2009, beginning with the episode: Bergensbanen: Minutt for Minutt (“The Bergen Train: Minute by Minute.”) To describe it in a nutshell, NRK strapped four cameras to a train headed from Bergen to Oslo, then live-streamed the entire seven-hour trip as the famously gorgeous scenery rolled by. Twenty percent of Norway’s population tuned in for the entire duration of the broadcast — demographics most any TV station would be thrilled with. 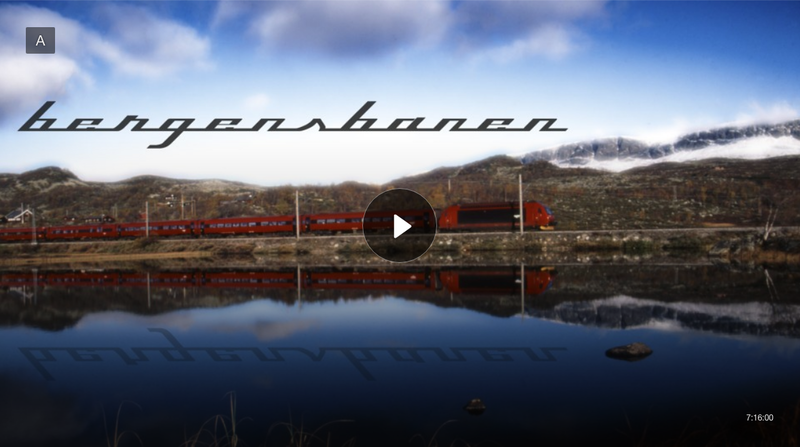 “Bergensbanen: Minutt for Minutt” also featured historic footage of the route and its opening day; interviews with passengers, the conductor and crew; and views into historic hotels along the route, like this one in snowy Finse, Norway. Viewers also got to see the short silent film “Bergenstoget plyndret inatt” (The Bergen Train Plundered in the Night) — the movie version of the 1923 book that launched the Norwegian tradition of reading Påskekrim (Easter Crime) novels over the holiday. Admittedly it might smack a bit of nationalism, but folks lined up along the shore to wave the flag as the Hurtigruten passed. I dare you to not get misty-eyed while watching these heart-tugging moments, especially when hauntingly beautiful Norwegian music plays in the background. Click here to watch the first minute of the program, and you’ll see what I mean. The next epic production (“Hurtigruten”) featured a 134-hour voyage via cruise liner down Norway’s incredibly long coastline, dubbed “The World’s Most Beautiful Sea Trip.” Again quite successful, the show not only helped skyrocket ticket sales aboard Hurtigruten’s ship the MS Nord Norge, but also launched a new Norwegian tradition for NRK minute-by-minute programs: that of grabbing your Norwegian flag and trotting out to greet the boat (or train) as it passed your town, thereby ensuring your two seconds of fame on film. The first four hours of the “National Knitting Eve” taught viewers the history of knitting, as well as tips and tools of the trade. The last eight hours were devoted to breaking Australia’s world record by producing a sweater “from sheep’s back to human back” in less than 4 hours, 51 minutes and 14 seconds. Click here to see the tense moments for yourself. Click here to see footage from “Fuglefjellet Hornøya.” Use Google Chrome’s web browser to watch this clip and any of the others that I’ve hyperlinked to here. Remember to click “always translate Norwegian” in the browser’s drop-down menu bar at the top of the page, and any Norwegian subtitles will be transcribed to English for you. My first personal experience with the minute-by-minute concept came last spring, when I found myself repeatedly switching to NRK2 to check in on Fuglefjellet Hornøya (“Bird Mountain, Horn Island”). 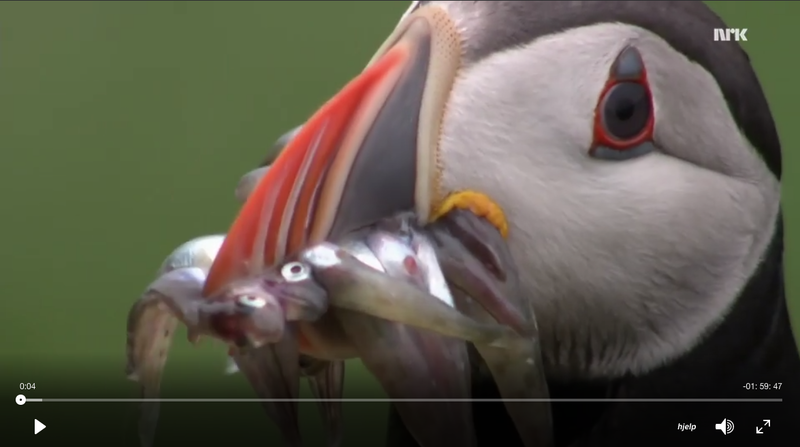 Five days a week during the breeding season, fifteen cameras mounted on seabirds’ nests gave viewers a voyeuristic perspective of various species mating, brooding over their eggs, and feeding their young, while off-camera commentators narrated the activity as if it were a sporting match. Even though I didn’t understand 98% of what was being said, I found myself oohing and aahing at the gorgeous birds and alternately wincing, laughing, or crying while watching their stories unfold. Check out at least the first few minutes of the Fuglefjellet overview footage here, and I think you’ll see what I mean when I say the visuals were truly captivating. I’ve since added the Hornøya Nature Reserve to my bucket list of things to do before we leave Norway. Our Sami guide, Tor, hitches his reindeer to a sleigh during our trip to Tromsø, a town that sits within the Arctic Circle. Check out my post to learn more. When I first heard about Reinflytting: Minutt for Minutt (“Reindeer Relocation: Minute-by-Minute”), I was pretty psyched about the prospect. I’d fallen in love with Santa’s traditional means of transport during our trip to Tromsø two years ago, when Matthew and I had taken a sleigh ride pulled by a reindeer. Listening to tales about the migration directly from a Sami herder himself had peaked my interest to learn more. But I recognized that the excitement level might be notched back a bit as a mere spectator witnessing the experience on the small screen. Years of farm living have taught me that cud-chewing animals spend tons of time doing nothing else but that. So I tempered my expectations. Along with other obstacles, NRK had to deal with the basics of reindeer behavior during migration — the herd stops every six hours for a one- to three-hour nap. Luckily, northern Norway experiences lots of daylight this time of year, meaning the event was visible almost ’round the clock. Turns out, NRK had its doubts about the program, too, nicknaming it “The Impossible Project” right from the start. Beyond frigid temperatures and snow, the very remoteness of the locale proved to be the largest technical hurdle. Limited satellite access required bouncing broadcast signals off of mirrors placed on mountaintops. Not to mention that the size of the herd (1,000+) meant providing camera coverage via drones, snowmobiles, and a “go-pro” mounted on the antlers of Muzet, a male reindeer tamed just months beforehand. Add to that a lead female reindeer who was reluctant to get the show on the road (the spring migration is typically initiated by the female with the most impressive rack … of antlers, I mean), and the production company feared they might have the makings of a real yawner on their hands. Perhaps the first sakte-tv flop. 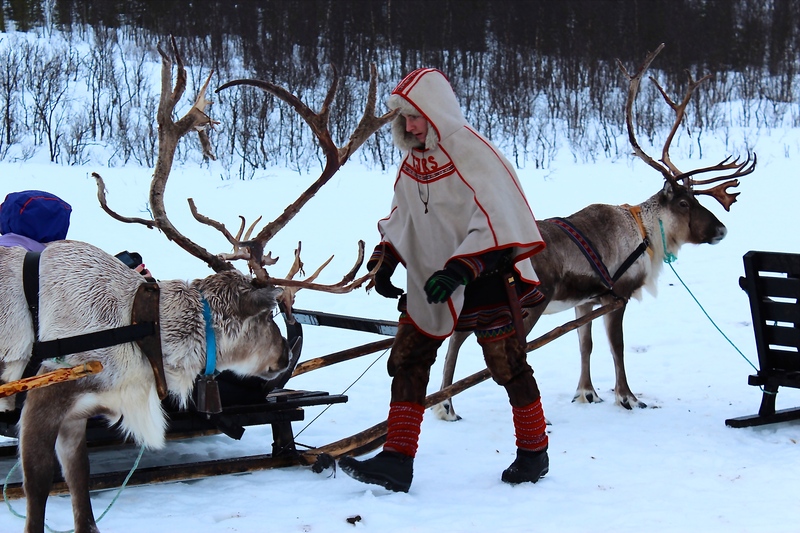 A Sami NRK reporter interviews reindeer herder Aslak Ante Sara and his wife Ravdna. The “Reindeer Migration” program wasn’t intend to be just another minute-by-minute installment but an opportunity to introduce Norwegians to their northernmost neighbors, the Sami — a people who’ve historically endured a considerable amount of discrimination. For my money, they needn’t have worried. Sure, the show didn’t possess the frenzied nature of the previous spring’s program, where viewers watched a raucous colony of seabirds “do the boom-boom” relentlessly and fight over food as if they were reenacting a scene from Hitchcock’s “The Birds.” But that didn’t make it any less mesmerizing. I found myself tuning in for hours at a time to catch the painstakingly slow progress of the Sara family’s herd as they made their annual epic journey from the frigid winter pastures in Finnmarksvidda to summer grazing land on the island of Kvaløya. The fact that reindeer migration is an age-old event orchestrated by the Sami people for around 3,500 years made the almost glacial pace of the show seem appropriate. Note the Booking.com logo. How’d you like to make a reservation for a real reindeer migration experience — a stay in a Sami trailer being towed behind a snowmobile? Of course, technology has changed the way modern-day Sami operate. Herders now use snowmobiles rather than dogsleds to round up their animals. Cattle dogs ride shotgun, occasionally jumping down to run and bark alongside the herd. And every now and then, Sami helicopters swoop in to keep things on track. But the overall experience still seems essentially nomadic. Most food and supplies get towed along on sleds, with quickie ice-fishing excursions helping to add a little variety. And when the reindeer stop for a rest, herders use the opportunity to take a cat nap in their lavvu, a traditional Sami tent. (The camera crew caught some zzzs in their tiny mobile home equipped with a portable heater). The 260-kilometer (161.5-mile) cattle drive usually takes anywhere from six to nine days — lots of time for a herder to be alone with his thoughts … and about a thousand head of reindeer. One of the herders takes some time out to try and catch a meal. Check out his itty bitty rod; apparently size doesn’t matter when you’re ice fishing. Take a look at the size of those feet! And don’t they have such sweet little moose-like faces? They remind me of Sven from “Frozen.” But they do look a bit like someone assembled their mismatched body parts while under the influence of a little too much Aquavit. Small scraps of tundra peek through the ice, exposed by hungrily foraging deer. Their snuffling noises, the crunch of snow, and the gusts of wind are the only noises to be heard. That’s not to say that every minute of the migration has a musical soundtrack. Most of the time, the footage has that deeply peaceful hush that snowfall brings, accompanied only by the quiet crunch of reindeer hooves as they paw at the ice looking for lichen. In the background, you might hear the faint jingling of reindeer bells, the occasional barking of dogs, and the distant buzzing of snowmobiles. But overall, you’ll get a good feel for the intense solitude that Sami herders endure. And when you couple such quietude with vast expanses of white, it’s almost like a sensory deprivation experience. Spending minutes at a time staring at the endless miles of frozen, gently rolling landscape is strangely meditative. Better than yoga, and perhaps a surefire cure for insomnia, if that’s what ails you. Primal is the word I’d use. Everything seems pared down to its essence. From a distance, even the herd’s tracks take on the graphic simplicity of a black-and-white drawing, dark lines etched on a pale canvas. Just imagine what your beat would be like as a snowmobile-riding policeman in northern Norway. But for those of you who are reality TV junkies, action film fans, or info gluttons, the show’s not all slo-mo. Interviews and newsreel clips with police make it clear that reindeer herding faces its fair share of tense moments courtesy of poachers. And historic footage gives a glimpse of herding life since the turn of the 20th century. Through it all, you get to meet the Sara family and witness their relationship with the animals and each other — my favorite moment was watching husband Aslak Ante prod his reindeer into the formation of a valentine for his wife, Ravdna. Herder Aslak Ante tossed out lichen behind his snowmobile as he traced the pattern of a heart pierced by the letter R in the snow. And the hungry reindeer came a runnin’…. Aslak Ante’s wife Ravdna and their shades-sporting baby look on as the reindeer pay their tribute. The reindeer must swim 1.5 miles (2.4 kilometers) across the Strait of Kvalsundet, a trip that takes about an hour. Makes circling the world on Christmas Eve look easy, right? Anyway, enough about my musings on the program. If you’d like to see more than just my bad photos of the TV screen and shots from NRK’s website, check out the Highlights Reel here, or scroll down NRK’s page a bit to read what happened each day and select which clip you’d like to view. 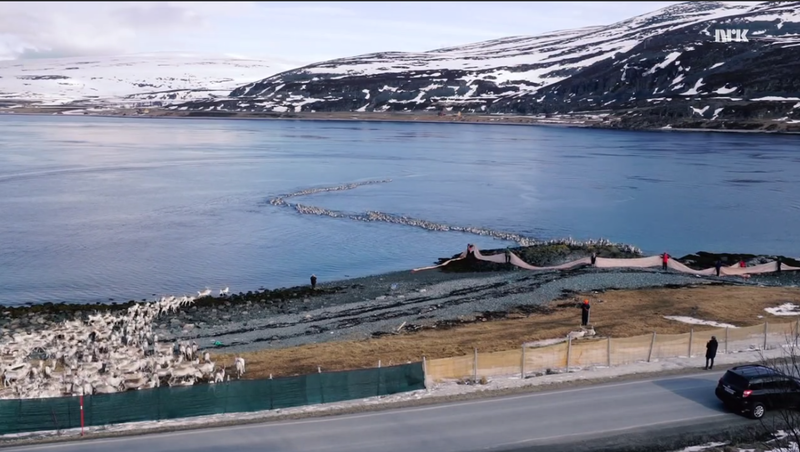 However, if you want to see the climatic ending — when the reindeer swam across the Kvalsundet Channel — you’ll have to watch footage from the previous year (if you’re impatient, fast forward 38 minutes into the tape.) Due to the sluggishness of the herd this year, NRK had to stop broadcasting before the moment we’d all been waiting more than a week to witness. Even without the payoff of seeing the herd touch shore in their summer pastures, I totally loved the program. Watching leaves you with the feeling that all is right with the world. The earth keeps spinning on its axis, the sun keeps shining, and life keeps moving on with the herd, repeating the same paths, the same migrations, year after year. Despite the stresses of modern life, somehow you feel that everything’s gonna be okay after all. And what more can you ask from a TV show than that?